AntLux's led outdoor string lighting will create a warm, cozy and nostalgic glow for your backyard and patio to relax and enjoy your own retreat with your family and guests. Our heavy-duty waterproof rubber casing is well-insulated so you can leave these led patio string lights year-round. New LED technology provide high brightness and lower energy usage and cost. Durable, impact-resistant acrylic bulbs that are unbreakable if dropped or stepped on. Commercial grade construction withstand extreme weather for year-round. Great for indoor or outdoor use. Linkable design can connect up to 10 x 52ft outdoor led string lights. The party lights string outdoor are compatible with dimmer. Brightness is adjustable as your desire. 18 high quality 2w dimmble led edison bulbs included. 18 hanging sockets made from durable heary-duty rubber. Easy and fast installation with built-in loops to hang perfectly. Very convenient and Hassle free installation. ✔ BETTER DESIGN - This outdoor string lights use the latest LED light pipe technology, improving the concentration effect of light. New design will have not only beautiful looking but also better performance. The led string light offer a warm soft and welcoming glow. ✔ DIMMABLE & CONNECTABLE - This patio string lighting are compatible with dimmers. Brightness is adjustable for your different requirements. 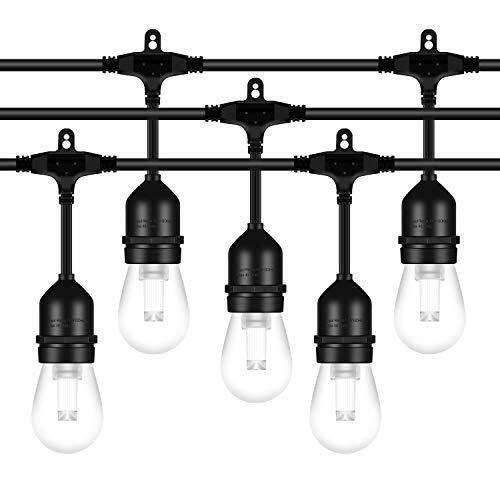 These lights also can connect up to 10 strands together end in end with no hassle. ✔ WATERPROOF & DURABLE - This outdoor led string light is IP65 waterproof for wet location. Made from tough rubber casing allows lights to withstand the extremely weather condition such as rain, snow, wind or damp climates at any time. Built with durability in material and even shatterproof as well. ✔ VERSATILE APPLICATION - Our led string lights outdoor are perfect for patio, backyard, garden, bistro, deck, yard, porch, gazebo, pergola, cafe, walkways, restaurants, store window, terrace and special events in party or wedding reception etc. ✔ QUALITY ASSURANCE -ETL approved. The patio lights has been tested and meets the requirements of string lights safety standards. AntLux's 3 years Warranty means we got you covered! Easy and fast replacement is offered if any quality issue about our decorative string lights. If you have any questions about this product by AntLux, contact us by completing and submitting the form below. If you are looking for a specif part number, please include it with your message.